The FBI has opened a probe into a surgical gynecological tool after reports have linked its use to the spread of uterine cancer in women during a procedure, the Wall Street Journal reported. The investigation suggests the largest manufacturer of the power morcellator, Johnson & Johnson, might have known about the severe risk of the device before warning physicians and the public. It was pulled off the market last year, according to WSJ, though devices from other morcellator manufacturers remain on sale. A spokesperson for the FBI Newark, New Jersey office said she could not confirm or deny whether it was conducting an investigation or not. A spokesperson for Johnson & Johnson's Ethicon division said the company had not been contacted by the FBI regarding the morcellators it once marketed. The WSJ spoke to three people who had been questioned by the FBI office in Newark over the past several months about the surgical device. 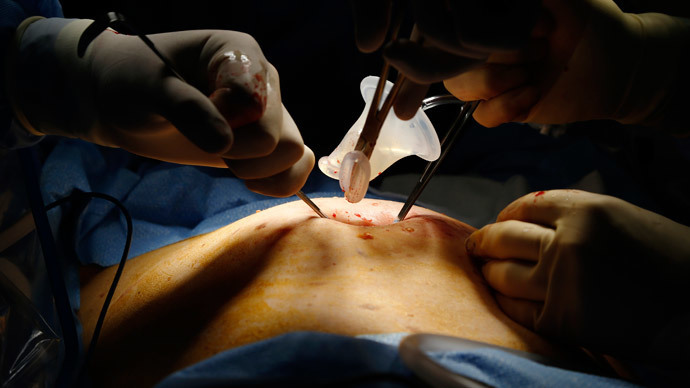 One of those people was Dr. Amy Reed, an anesthesiologist who underwent a hysterectomy for fibroid removal in 2013 only to discover the morcellator had made her cancer worse. Reed, along with her husband, are campaigning to ban the use of the device to save women’s lives. Another woman spoken to by the FBI was Sarah Robinson, a physician assistant in Los Altos, California who told the WSJ she was contacted by the agency two months ago. Robinson had testified at a Food and Drug Administration hearing on the device, and created a list of women and families who blame the morcellator for making their cancer worse. Robinson had sent the FBI a list of 386 names, including herself. The probe follows a warning issued in November 2014 by the FDA that said the device shouldn’t be used on the vast majority of women. The agency said one in 350 who underwent the procedure had an unsuspected cancer sarcoma. The agency called for a “black-box” warning on the tool, which is the strongest warning at its disposal. Since then, many hospitals and several of the nation’s largest health plans either have limited use of morcellators or are considering limits. The device has been used in tens of thousands of minimally invasive laparoscopic procedures a year, where the morcellator cuts up benign uterine growths, or fibroids, into small fragments so the tissue can be vacuumed through tiny incisions in the body. The device is also used in hysterectomy removal when a woman’s uterus is enlarged. These procedures lead to quicker patient recoveries, less post-operative pain and fewer wound complications. Recent medical evidence, however, suggest that the removal of the tissue may not be 100 percent effective. If any of those tissues contain cancer cells and do not get removed, they spread to other areas, leading to the development of cancerous tumors. The decision by Johnson & Johnson to pull the device was driven in part by the concern of a former Pennsylvania pathologist Robert Lamparter, who wrote about the issue at the J&J subsidiary, Ethicon, in 2006, after he began noticing more morcellated specimens in his lab. Among other concerns, he noted the potential for an undetected cancer to be inadvertently spread by the surgical instrument. He said that at his small hospital, which had done 292 hysterectomies the previous year, gynecologists found an unexpected malignancy at least once annually. J&J spokesman Matthew Johnson confirmed the 2006 correspondence with Dr. Lamparter to the WSJ and said the doctor’s concerns led the company to revise the instructions for use of the device.